The PowerShot SX150 IS is a compact digicam with powerful features for both beginning and enthusiast photographers alike. Its feature set, quality and full control make it a camera to consider if you on a tighter budget. Read more in our Full Conclusion. Canon's PowerShot SX150 IS is an entry-level camera with a host of nice features. They include a 14.1 megapixel CCD sensor and a 12x optical zoom with a 28mm wide angle lens (in 35mm terms). All of the new 2011 model PowerShots come standard with Canon's proprietary DIGIC 4 Image Processor as well as Smart AUTO for novice shutterbugs. Smart AUTO "analyzes faces, brightness, colors, distance and movement and selects the appropriate setting based on 32 predefined shooting scenes (for stills) and 21 scenes (for video)." In addition to making it easier for newbies, the SX150 IS also features Intelligent IS (Image Stabilization) for six different shooting conditions (Normal, Macros, Powered, Panning Dynamic, and Tripod). This camera also has manual-shooting capabilities (such as aperture priority and shutter priority) and a "discrete shooting mode" to help eliminate disturbances while taking stills. Home movie lovers will also enjoy shooting video in 720p HD, with the ability to optically zoom while filming. Menu access and photo reviewing are a snap thanks to the large, bright 3.0 inch LCD screen. 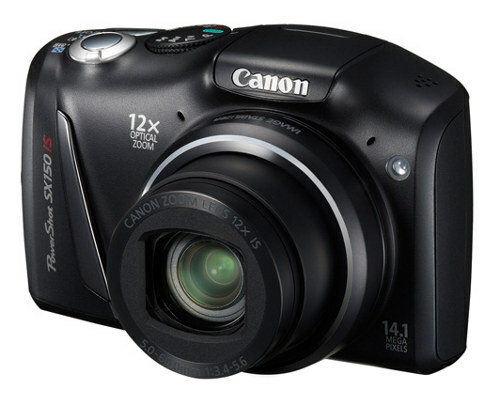 The Canon PowerShot SX150 IS is available in black or red with an MSRP of $249.99. See our buy box below for the most current pricing at various online retailers.